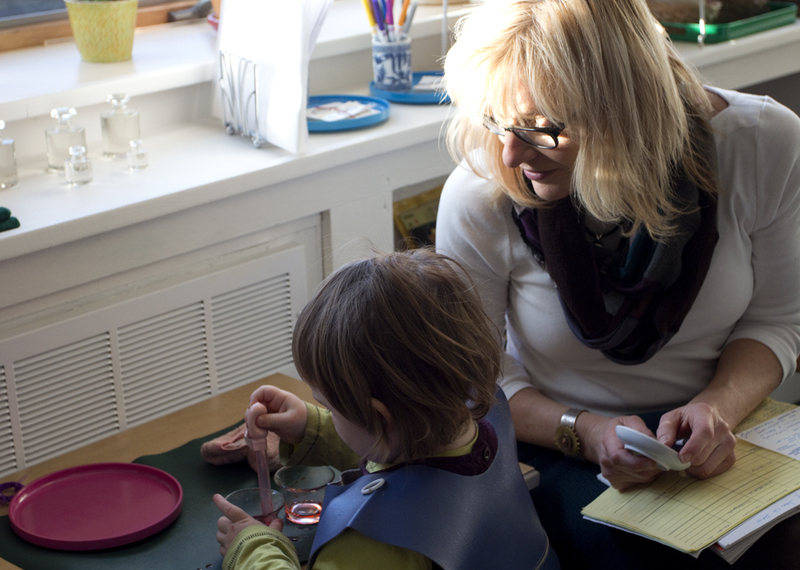 See into our primary rooms and hear two parents describe their impressions. One child may spend the morning writing a story with the movable alphabet while another may be painting, scissor cutting, or table washing. Simple ground rules such as returning work to the shelf ready for the next person, using indoor voices, and walking around work mats create a predictable environment where everyone feels safe and respected. Practical life - This is typically the first work introduced to young children. Activities such as pouring, using scissors, tonging, and wiping a table promote coordination and strengthen the hand in preparation for writing. Language – Materials in this area act as step ladders for children working up to reading and writing. 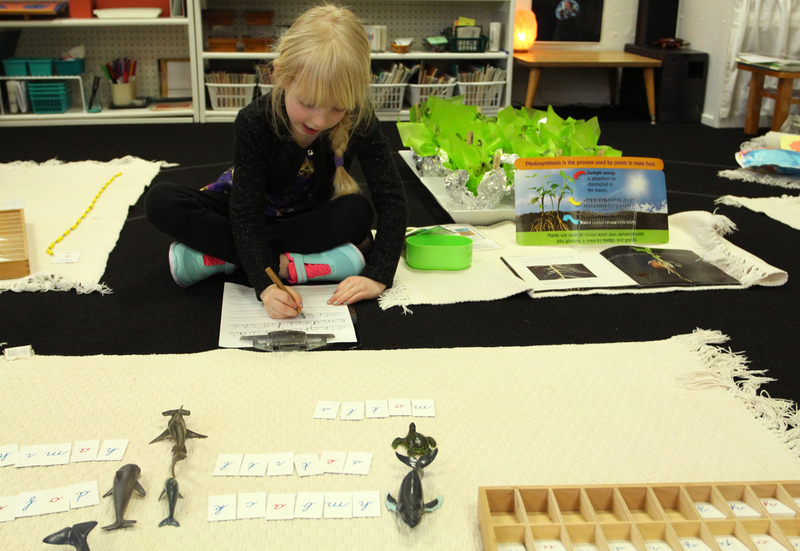 Here, a child has composed words using the moveable alphabet and is choosing to record her words as a list of nouns. This is speech made visible. Math – Montessori materials illustrate math concepts brilliantly. Each function is expressed with hands-on manipulatives so that children can approach mathematics in a physical sense. As children become more advanced, the materials aide the progression from concrete to abstract. Here, a student uses numbered wooden strips to perform addition. Culture – Children learn about people and places of the world through books, maps, flags, songs, and dance. Geography, science, music, and art are included in this area. Sensorial – Children use their hands to explore and understand the world around them. 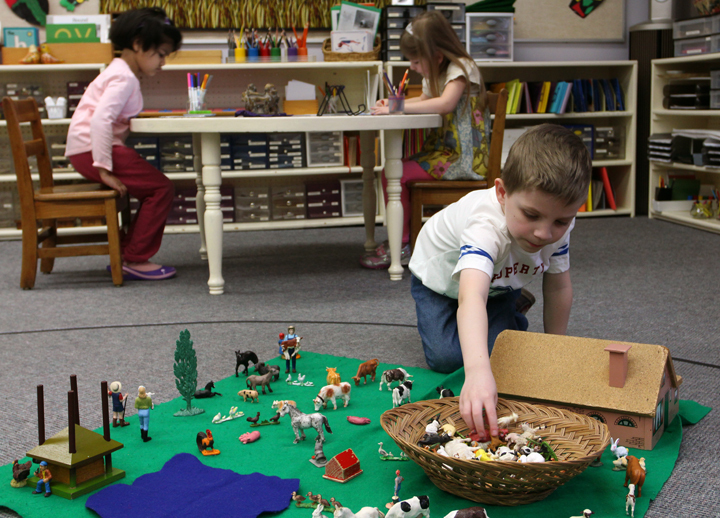 Hands-on materials are prevalent in a Montessori classroom. This area allows children to explore using all of their senses. While there are specific areas in the classroom which are dedicated to art, many of the materials and work activities bring together various concepts. It’s all about connecting the dots between ideas. Before the first day, new students meet in small groups with teachers and are introduced to a few materials. When they come in for their first day they have an idea of how to get started. The benefit of the 3 year classroom cycle comes into focus when older children return from summer break and join the younger ones. Older children immediately become mentors. Younger children are inspired by their older friends' knowledge and think, "I want to be able to do that!" As time goes on, children work toward mastering concepts by working with materials in different areas of the room (see slideshow above). Teachers introduce new materials (new work) along the way. There's no end to learning. Concepts build upon each other so that children can go as deep into math, science, art, geography, or language as they want. All along the way children are gathering tools and honing the skills they need to sail off into learning.